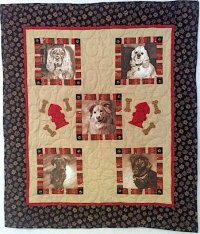 Happy Memories is now offering a Trunk Show that you can have come to your shop to help promote classes and products. 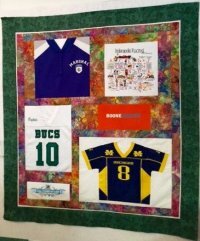 Our Trunk Show and your talent combine to make the perfect opportunity to promote T-Shirt and other kinds of Memory Quilting in your shop. 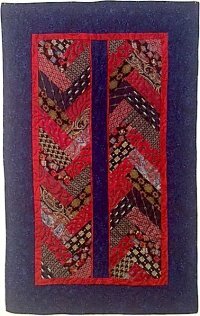 The quilts in the Trunk Show are all small examples of Memory Quilts so that it is easy for you to display them in a small space, about the equivalent of a queen size quilt. 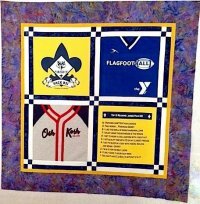 They include a variable size T-shirt quilt (49" x 53.5"), a squared up T-shirt quilt (40" x 40"), photo quilt (32.5" x 37.5"), tie quilt (27.5" x 44"), and a pillowcase (20" x 32"). Click HERE to read the detailed terms for scheduling the Trunk Show. Use the form below to submit a reservation request. We will then contact you with specific availability and details. Please complete the form below to submit a Trunk Show reservation request. Please provide both a 1st and 2nd choice month for the show to be in your shop in case your first choice is already taken.